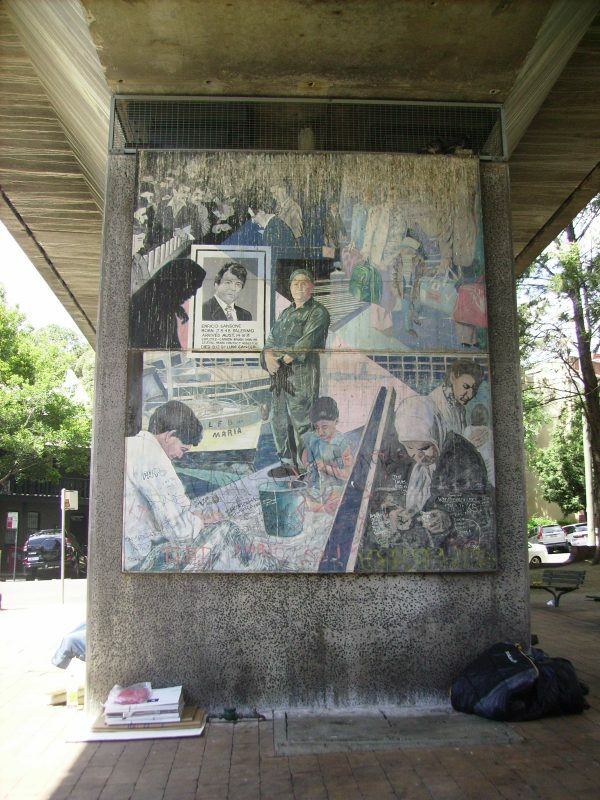 Women of Woolloomooloo is one of eight murals painted on the railway pylons at Woolloomooloo, showing the history and people of this suburb. 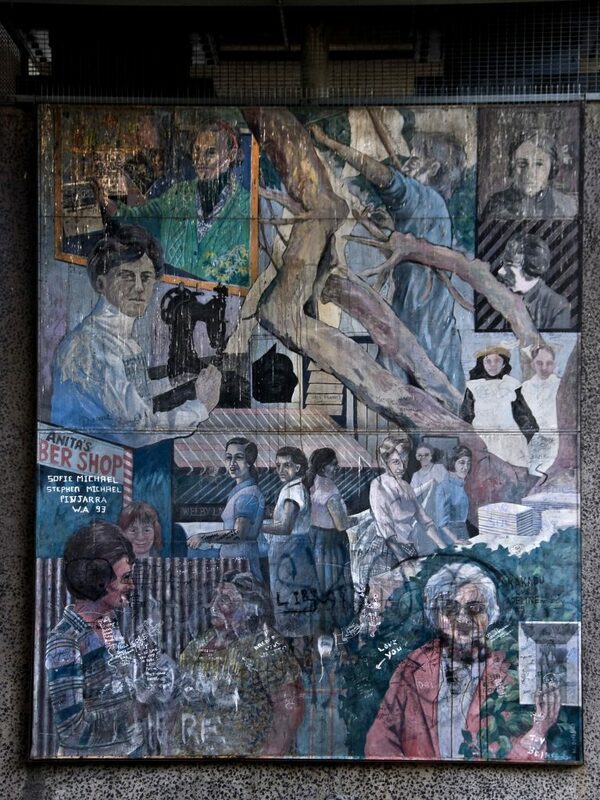 This mural is devoted to the women who lived and worked in Woolloomooloo throughout its history. It commemorates the everyday lives of the working-class – school girls, seamstresses, domestics, textile and laundry workers – as well as the strong, courageous women who led the fight to save the suburb during the 1970s. 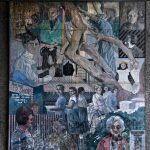 Brenda Humble and Honora Wilkinson, founding members of Residents of Woolloomooloo, and Nellie Leonard, founding member of Woolloomooloo Resident Action Group, are given pride of place in this artwork. The artwork also depicts the local villains, like notorious gangster Tilly Devine. 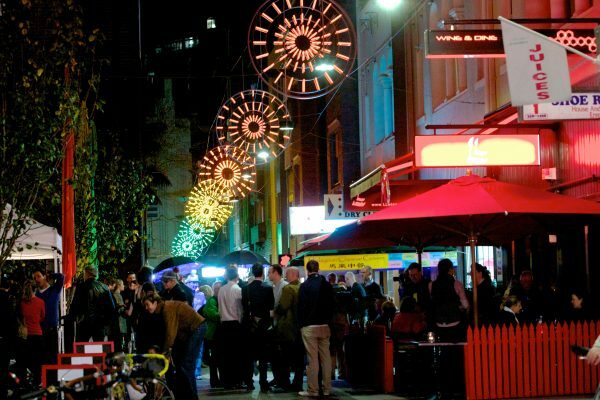 Tilly terrorised the neighbourhood in the 1920s and 1930s with a vicious razor gang, and ran the biggest and most lucrative brothel network Sydney has ever seen. 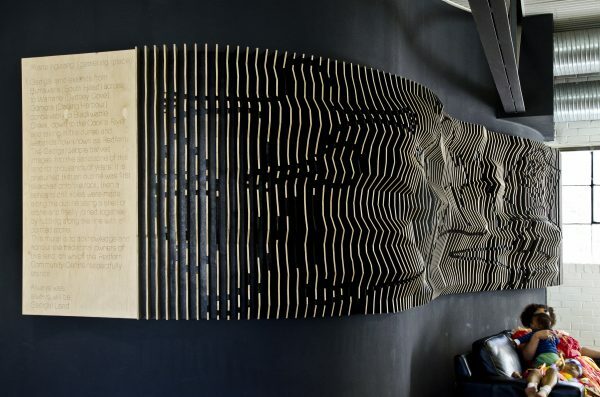 In the centre of the artwork, is the face of an Aboriginal woman – a stark reminder that the original inhabitants of the valley were driven from their homes by the European settlers. 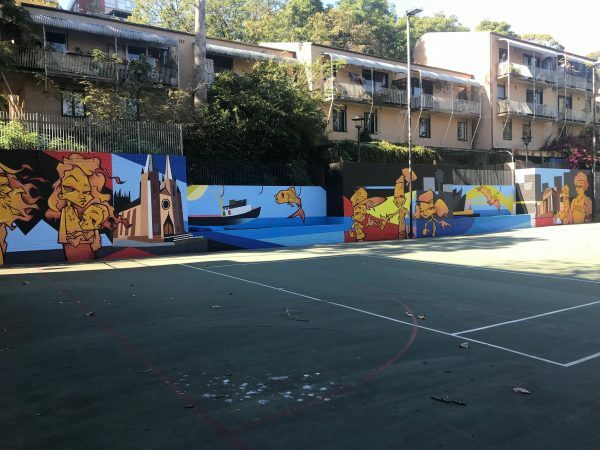 By the time this artwork was painted, only a small Aboriginal community survived in Woolloomooloo, and their way of life had been changed forever. Painted using details drawn from historical records, newspapers, archives, photographs and the personal memories of the local community, Women of Woolloomooloo celebrates the diverse roles played by women in the suburb’s unique history.